Eyes and Drains and Books and Films! Oh My! Did we just have summer? Can't it come back?? The weather was glorious here this weekend - blazing sunshine, not a cloud in the sky - from Friday through Monday. And today it's a bit grey and quite a lot cooler. Mind you, I'm still sat here in shorts but I suspect once I air out the house the temp in here will drop too. And finished off yesterday evening by watching "The Life of Brian". I was a bit ambivalent - there were a lot of funny bits, but I felt some jokes out-stayed their welcome and there was too much set up for others (so you'd laughed at the joke before it arrived). Still it was funny, I probably prefer (my memories of) the Pythons' sketches - which doesn't entirely surprise me, on a general level I prefer watching comedy that is sketches or stand-up, not narrative. Odd to see some of the bits I knew of already, but in actual context - "He's not the Messiah! He's a very naughty boy!" or "I'm Brian and so's my wife!". And I had "Always Look on the Bright Side of Life" going round my head afterwards (until a conversation this morning replaced it with The Cure). I grew up in Corvallis, and went to school for a few years in Eugene. 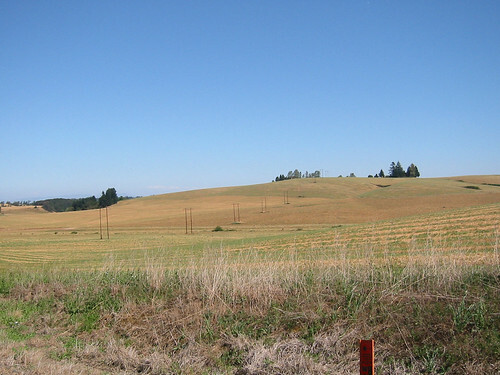 The area between Portland and Corvallis that most of the series is set in is the Willamette Valley (named for the river that runs down the middle of it) and is largely agricultural. With cars, you're a couple of hours from the Pacific Ocean (there's a mountain range in the way) and a couple hours from the Cascade mountains in the other direction--where it's largely resort/ski towns and natural forest. I think I have the last book of the second trilogy in my hold queue at the library, I should see. Hmm. Ahha, thanks! I had this vague feeling you'd said you knew the places when I last mentioned this book - it must be quite a different experience reading it if you know the area well. It's a bit surreal at times actually, to picture it all. I think it's one of the first science fiction books I've read that's set somewhere I know very very well. And times when it makes me laugh, there's a bar/pub in the mentioned in the first book (the Peacock I think) that does actually exist and I know rather well. There's two trilogies set in "The Change" and then an earlier trilogy I've not read that's related to the cause of things, apparently. And I was just reminded, one of my first impressions of southeast England's countryside on the train was that it made me think of the Willamette Valley, all the sort of rolling agricultural whatnot. Ooh, yeah, can see what you mean there.